You are at:Home»Opinion»Will investor confidence falter in 2019? IBA, the independent aviation advisory, valuation, and consulting firm, has analyzed its market intelligence and research data to identify a range of factors impacting market growth and asset values. Despite the pain seen in India, Europe, South America and South East Asia – which is hard to ignore – aircraft pricing remains high. Yet payment defaults are on the rise and contingency plans are being prepared. Even though the market realizes that it has been some time since the last down-turn, most are under the impression that in this cyclical industry a fall will precede a rise once again, so investors are continuing to angle for good deals. The problem is that as long as funding remains in such abundance, the downturn could arrive and there will be so many buyers looking for a bargain that pricing may not shift very much for assets in high demand. Oil price certainly contributed to an increase in airline failures in 2018, and with tighter cooperation between producers, IBA expect less market elasticity. Brent pricing at US$50/b is unsustainable for any exporter to balance their budget despite low extraction cost – so IBA expects that pricing will settle at US$70-80/b. While the US dollar remains strong, yields remain too low for sustainable profitability outside of US market. 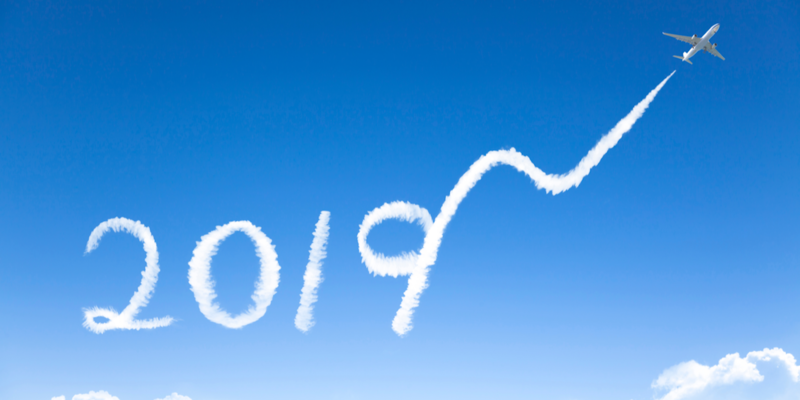 2019 is expected to offer some stability on oil price fluctuations, but airlines must remain flexible to manage capacity and fares. Slowing GDP will lessen world trade and moderate passenger growth. And whilst raising interest rates will indicate an improving economy and should improve lease yield, a strengthening dollar will hinder airline profitability and bankruptcies will follow. Foreign exchange issues areexpected to remain while the dollar remains strong and airline failures and rising costs are expected to increase unless oil price falls by >10%. The airline failure outlook for operators in countries bordering the Indian Ocean, South East Asia, Argentina and Mexico highlight significant challenges ahead. Those European carriers unable to compete against the large legacy groups or LCCs will continue to struggle and failure/consolidation is inevitable; the value of slots remains a strong catalyst. Production is set to get back on track for Airbus neo & Boeing MAX. Airbus expects A320ceo/neo to reach 60 per month by mid-2019, which will push deliveries to 700 for 2019 and 720 for 2020. Boeing’s 737 production is looking to reach 57 per month by mid-2019, which will raise deliveries to >650 for 2019 and >680 for 2020. The market remains challenging for widebodies. The drop in oil price increased demand for older types, and A330s have proved to be useful and cheap enough to transition, despite a large parked fleet, because they remain flexible like the B767. However, I expect freight conversions of B767s and A330s to accelerate this year. The 777-300ER remains a mainstay of the global fleet and demand for new 777-8/9 remains poor. The 787 and A350 remain top of the list and potentially will shift the heart of the market away from the 777. For IBA, the 777-300ER remains on watch. Just how these assets trade in 2019 will be kept under close scrutiny especially as the market is avoiding re-configuration at lease-end at all cost. A further market disruptor is Boeing’s New Mid-Sized Airplane (NMA). This could make an appearance in 2019 to either give a boost to the large narrowbody/small widebody market; or seal its fate. Boeing may not want to create the market alone. 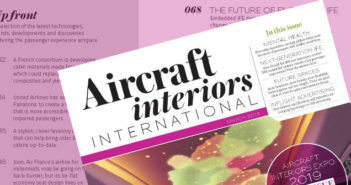 In the regional jet arena, IBA predicts that OEMs will focus on scope in the first instance to build an aircraft that is compliant rather than wait for a change to happen. Weight, seats and size must be addressed. Leasing continues to grow, and the strongest signals for investing are emanating from North America and Japan. Although Korea’s expansion into aircraft leasing is imminent, the number of new Chinese entrants has reduced and many are preparing for a possible market correction in lease rates and values – both beneficial to start-up lessors. The potential GECAS sale remains high on the agenda for 2019, as does the potential IPO, partial sell-down or complete disposal of several top 50 lessors. Prices are high so it would seem to be a good time. 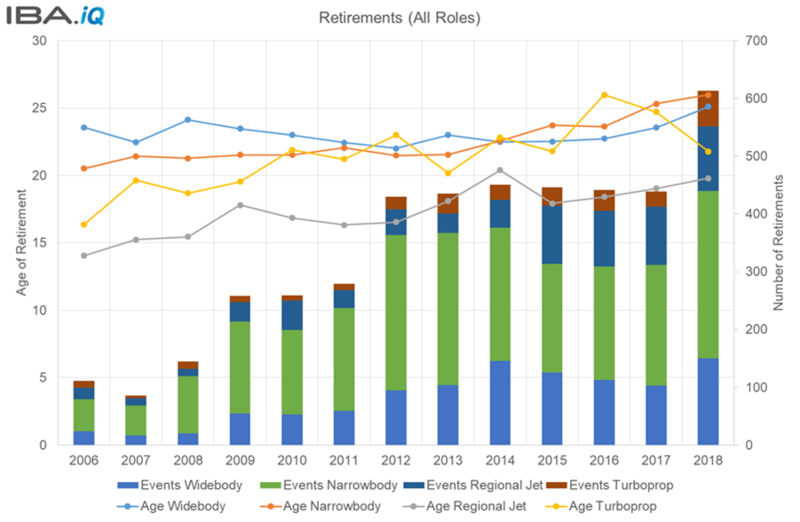 According to IBA, although retirements may be on the up for first time in seven years, age continues to rise for narrowbody, widebody and regional jets, whilst for turboprops it is declining. Demand for parts to maintain this ageing fleet will grow, particularly engines which remain in very high demand. Operators will find more cost-effective solutions to maintain their fleets and refrain from taking on the operational risk and higher ownership costs of new technology. 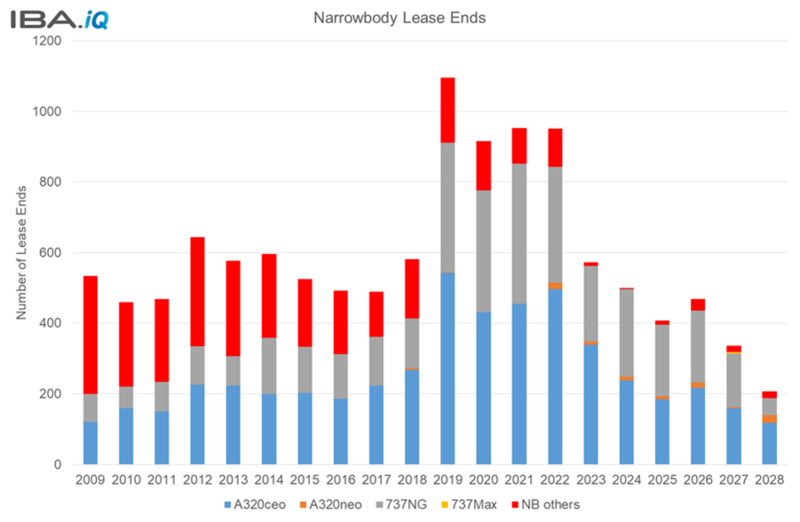 The bow-wave of lease ends for narrowbodies maintains its shift to the right, which could cause a significant problem for both lessors and lessees alike as MROs are unlikely to be able to handle return demand. It is likely that both parties will have to accept weaker physical conditions at return. This could suit lessors looking to maximize cash at lease-end, but may lead to a higher number of retirements/part-outs if the asset cannot be placed quickly. With a strong US dollar, non-US based lessees will struggle to handle higher cash return conditions if the aircraft is on lease-end compensation terms. Extensions will maintain this trend, but the wave will simply get bigger until the aircraft reach natural retirement. Fewer extensions have been triggered with widebody leases. However, the large number of parked aircraft indicates further challenges that lessors face in being able to place them, with configuration cost being a strong factor. IBA notes that lease rates have shown some improvement after a long period of decline/stagnation. New aircraft values have firmed as rising interest rates take effect, but a strengthening market has also firmed up older variants of the A320 and 737-800. Lease rate factors remain very low and some buyers are possibly making rash decisions. Market share, lower return on investment criteria, ability to invest in dollar denominated assets, the ability to fund through alternative methods, and attraction to high cash flows will work for some participants. But for those that expect the market to remain bullish, or rely on unrealistic market scenarios, time may be running out. Values remain strong, but how these evolve for 2019 remains complex for older assets in high demand as many of these saw an increase >20% across the course of 2018. Oil is expected to rise, the US dollar isn’t expected to weaken just yet and traffic demand is set to remain firm. New technology will continue to be delivered at an ever-increasing rate and freight demand for narrowbodies is set to continue. IBA is expecting a market correction for values as new technology becomes more available (and reliable). The bottom of the market needs this to happen to feed into the freight programs and parts markets. It could occur more quickly if there is a sudden change in traffic demand, oil price or finance availability, but these are hard to predict.